I started off with the central layers. For the jelly layer I went super lazy and used a purple grape box jelly I had on hand. The other layer was the Honey Panna Cotta recipe I shared last week. One of the newer components was the warm milk sponge cake. You could definitely use a joconde sponge, but after 3 cakes in a week I wanted as low effort as possible. This entire dessert was essentially going as low effort as I could. I littered it with strawberries to give it a little something extra. Look, effort. The very last layer was a white chocolate and passionfruit mousse. I just love the smell of passionfruit. I cut two rounds from the sponge cake (leaving the rest in the capable hand of my fiance to dispose of) and plopped one on top of the mousse. Next came the honey panna cotta and jelly layer I’d chilled in the freezer. Last came the layer and more mousse! I ended up having to squish it down a little as the half quantity of mousse wasn’t quite enough for the size of the cake ring. And then there was a little mishap with the freezer losing power. The bottom layer of sponge ended up taking up a lot of moisture during the few hours the freezer was down, so I lost a lot of the bottom layer. Thank goodness there were a lot more layers left to enjoy. The quantity in the recipe is large enough to make a full sized cake using about a 20-22cm cake mould. It definitely relies on a couple of shortcuts and having things in the pantry. 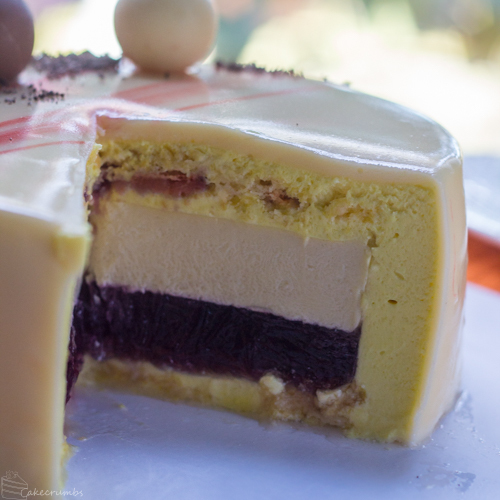 But if you want a fresh fruit jelly layer, for example, you could always refer to my previous entremet for that. A fresh, fruity and chocolatey dessert that's sure to impress! Grease and line a cake tin. It cake be baked as a sheet cake or in a round cake tin, choose based on your final cake size. Preheat oven to 180°C (355°F) for a round cake tin or 200°C (400°C) for a sheet cake. Sift flour and baking powder together in a bowl. In a large mixing bowl or stand mixer, combine the eggs and eggs yolks with the vanilla extract, sugar and salt. Beat at high speed until the mixture is light, fluffy and has roughly tripled in volume (6-8 minutes). Meanwhile, warm the milk and butter in a small saucepan (or even the microwave) until butter had melted and mixture is hot (but not boiling). Fold the flour mixture into the egg mixture a third at a time, taking care not to overmix and lose too much volume. Finally, add the warm milk mixture to the batter and gently fold until just combined. Pour the batter into the cake tin. If using, scatter the sliced strawberries on top. Bake for 20-25 minutes for a round cake tin, or 10-15 minutes for the sheet cake. Cake is done when the top is golden and it springs back when lightly touched. Allow cake to cool completely before removing from tin. Prepare a small cake tin, preferably smaller than the final cake mould you will use. Line with plastic wrap. Bloom the extra gelatin by sprinkling it over the water and allowing it to sit for 5 minutes. Bloom the gelatin by sprinkling it over the water in a small bowl and leaving aside for 5 minutes. Meantime, in a medium saucepan heat the cream, milk, honey and syrup over low heat until honey dissolves. Continue to heat mixture until cream just begins to boil, remove from heat. Add bloomed gelatin to the saucepan and stir until gelatin dissolves. Stand the mixture at room temperature to cool. Heat the milk and passionfruit flavouring in a medium saucepan until warm (do not allow to boil); add the bloomed gelatin and stir until dissolved. Put chopped chocolate into a bowl; pour milk/gelatine mixture over the chocolate and stir until chocolate has melted. Whip cream to soft peaks. Fold 1/3 of cream mixture into the mousse to lighten; fold in the rest of the cream in two batches until just combined. To assemble, prepare your cake ring, cake tin or cake mould. Pour a small portion on the mouse to cover the base. Add one half of the sponge, followed by the jelly/panna cotta layer. Add a quarter of the mousse to cover the jelly layer and fill around the sides. Finally, add the last layer of sponge cake then the remaining mousse to cover. Place cake in the freezer until completely frozen though. Unmould the cake just before pouring the glaze. Combine the half cup of water and the powered gelatin in a small bowl until the gelatin blooms. Place the grated white chocolate in a large bowl and set aside. Meanwhile, in a medium saucepan, combine the sugar, condensed milk and remaining water. Heat mixture over medium heat until it’s simmering steadily (if you have a candy thermometer about 100°C is ideal). Remove from heat, add the bloomed gelatin and stir until dissolved. Pour the mixture over the white chocolate, stir gently to combine. Take care not to stir too vigorously so as not to add air bubbles to the mixture. Allow glaze to cool to around 30-35°C. At this point it will feel warm to the touch and will coat the back of a spoon. If the mixture cools too much to pour it can be gently heated again. If adding colour, divide mixture into small bowls and gently stir in the gel food colouring. Colour can also be added to the palette knife in the last step. Remove the mousse cake from the freezer and prepare it for pouring either by placing it on a cake rack or an overturned ramekin. Pour the glaze over the top of the cake, completely coating the top and sides. If the glaze drips too quickly and is too thin it hasn’t cooled enough. If its thick and doesn’t drip, its too cold and needs to be gently heated. Once the cake is coated with the base colour glaze you can add dollops of other coloured glaze. Leave it to drip as is, or use a palette knife to spread the colours and smooth the top.